LPG is used as a fuel in a range of applications including in heating and cooking appliances, industrial applications, in vehicles and as a propellant and refrigerant. 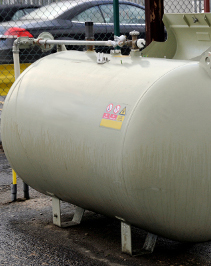 LPG can be obtained primarily as propane, butane or a mixture of the two. A powerful odorant is added so that it is easily detected. If you are a domestic user (ie at home) of LPG then further information is available via UKLPG. UKLPG also have a tool for people to consider whether they need to replace their buried pipework. If you are a landlord then further domestic gas information is available at general landlords' duties. To prevent risk we need to find out more about your LPG pipework. HSE will use the information you provide to prioritise a pipework replacement programme. When the risks are properly identified and managed, LPG can be safely used as a fuel source for many applications. We have provided information that is aimed primarily at users of LPG to help ensure it is used safely.